Tom's burger and fries at Donde Bocha Antogeria in Atenas. I ate the little side cup of guacamole. This morning's visitor, a large centipede. It doesn't appear to be venomous. Tom scooped it up and put it outdoors in the garden. After posting our story on September 25th, about the top 20 most dangerous countries in the world to vacation, (click here for our story) we received a few email messages inquiring on the more positive side; what do we consider the top countries in the world to visit? Charlie ordered this plate of beef nachos. There was a bottom layer of tortilla chips. I could have had this without the chips and dressing which would have been meat and lettuce which wasn't very appealing to me. People we meet and our readers often ask our opinions on favorite places to visit in the world based on our travels thus far. We've even had an opportunity to speak to some of our readers on Skype when they are contemplating a vacation/holiday and aren't quite sure where to go and would like feedback from us on the topic. This is a tough question to answer. It's comparable to asking a person what books they prefer to read, their favorite movies and which foods they prefer to eat. It's highly subjective. Our personal preferences for choosing travel locations and bookings are varied based on affordability, personal interests, and long-held beliefs and desires to see certain parts of the world. This is the outdoor restaurant, Donde Bocha Antogeria, we visited with neighbor Charlie for lunch. Also, there's a vast difference in staying in a hotel or resort for a two-week vacation as opposed to "living" in a country for an extended period. Even if the property is exceptional, living as if we were locals is entirely different than the attention and amenities provided to tourists at a hotel or resort. We're basically "on our own," fending for ourselves for transportation, meals, and entertainment. In a resort or hotel, a typically readily available concierge or front desk staff usually takes care of everything, if one so chooses. Tom liked Imperial beer made in Costa Rica. During a one or two week vacation in a country, the traveler's perspective may be entirely different as opposed to that which we experience over a three-month period. 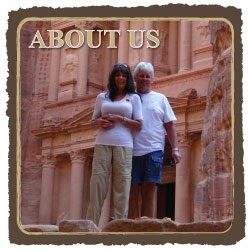 Their goal is generally to pack in as many tours, shopping and dining experiences as possible. Often tourists bring along an extra empty piece of luggage to contain their purchases. We often see this on cruises where many focus their attention on shopping and dining at each port of call. This surely must be fun for those who find it enhances their experiences. For us, such an objective is far removed from our reality. We rarely make any purchases, although we may wander through shopping areas in certain ports of call, more for photo ops and sharing the experience with our readers than to purchase anything. After lunch, when Charlie took off to shop, we visited the Central Market in downtown Atenas. As for dining out during ports of call or in countries in which we're living, it's a two-pronged consideration; one, frequent dining out is costly and two, most mid-range restaurants can't accommodate my way of eating. People often ask how we can possibly enjoy ourselves without dining and shopping in many countries. Here again, our objectives simply aren't the same as most travelers. One of our major interests is in shopping for quality food to create healthful and suitable homemade meals at our temporary home utilizing the flavor and availability of locally grown produce and sources of protein. In essence, this has become a hobby for us as we've traveled the world. Inside the Central Market, there are many casual dining spots. Although in many countries we've dined out regularly as we will upcoming in Buenos Aires where we'll be living in a hotel for a month and then beginning February in South Africa we'll dine out frequently since most of the food is organic and centers around delicious roasted meats and vegetables. Here in Costa Rica, dining out isn't a priority when most meals include tremendous amounts of starch. Believe me, if I didn't have to eat as I do for health, I'd be all over the tortillas and flour/corn-based products. Tom, a picky eater, doesn't care much for ethnic foods, tortillas or even guacamole. Recently as shown in today's photos, we went to lunch with our neighbor Charlie who lives a few doors from us. We visited a traditional Costa Rica restaurant in Atenas. After carefully perusing the menu, the only items I could eat was the guacamole with nothing to dip into it and the pico de gallo, not necessarily meal worthy. Produce is for sale all week in this market as opposed to the Friday Feria Market where we prefer to make our selections. It appeared many items were imported. I didn't order a thing except for a glass of water, especially when the language barrier prevented me from inquiring if their kitchen is technically "gluten-free" meaning separate prep and cooking areas free from any contamination from grains, starches, and sugar. That's not possible here in Costa Rica unless one is dining at a pricey high-end establishment of which there are none in Atenas. Surely in San Jose, a 40-minute drive, there are possibilities but it just hasn't been worth making the long drive to eat an overpriced meal. When we head to Managua, Nicaragua in 28 days, we'll dine in upscale restaurants and hotels which can usually accommodate my requirements. Thus, it's easy to see how our preferences for "where are the best places in the world to travel," are considerably different from that which the average traveler may find appealing. None the less, it's fascinating to hear about the preferences of others. A larger produce seller in the Central Market. We're always happy to share our perceptions of top places to visit in the world but encourage those inquiring that our preferences may vary considerably from that which appeals to them. Most of us prefer a location of beauty, great scenery, good weather and reasonable prices with interesting culture and possibly wildlife. Many have virtually no interest in wildlife which has greatly influenced our choices. That's it for today, folks! Have a fabulous weekend wherever you may be! Tom spotted this local woman carrying straw on her head moments after we returned to Sumbersari after the five-day visa extension process in Lovina Bali. It felt good to be back "home" for the final leg of our stay in Indonesia. Click here for more details. ringing across the way at the SS. Jacopo e Ginese Catholic church. See our link here. This morning's view from the veranda at 5:30 am. It's interesting to watch our readership ebb and flow depending on the topics we cover in a particular day's story and photos. Yesterday's churches story and photos showed a sharp decline in hits which surprised us. But, true to our word, we're completing Part 2 today with photos of other breathtaking and historical churches we've seen throughout the world. With too many such church photos to post in only two days, we'll end this segment and move along tomorrow to another story with new photos. A scene on the interior of the S. Maria Assunta Catholic Church in Benabbio, Italy in June 2103. See our link here. However, for our historical and quaint building enthusiasts, we share another batch of church photos from our world travels over these past years. Based on the number of passengers we've observed attending historical buildings tours on cruises, there are more historical building enthusiasts than we can imagine. No doubt, there comes a point for those who travel frequently, that the lure of historical buildings eventually wafts away and they become more attracted to other tourist attractions. Gerry, Nicole, and Tom outside a quaint little church n Mykonos, Greece in June 2013. See our link here. A few years ago, we thought we'd reached such a plateau but now after considerable time away from countries known for their hundreds of years of history with architectural acumen, our interest is renewed and once again, we're finding churches and old buildings of great interest. Many of these photos were taken a few years ago since during the past two years we've spent less time in countries specifically known for their historical buildings. We've lived on many islands with outstanding temples and palaces but, the majority of these were found in Europe. Busy preparations surrounded the Igreja De Campanario church in Campanario Madeira on July 2014 as workers rushed to get the decorations in place for Saturday's religious festivities. See our link here. Sometime in the next several years, we plan to return to Europe. Although we visited and lived in a few of Europe's countries, one could spend a lifetime exploring all the treasures found in European countries. We've traveled very little in eastern and central Europe and not at all in Scandinavia. We look forward to seeing more in the future. The world is a huge place. At times, we meet people who start rattling off places they've traveled, including many we've yet to see. Living this life isn't a marathon. Here we are wearing saris standing at the foot of the steps at the Pulaki Temple (Monkey Temple) in Singaraja Bali in May 2016. See our link here. We don't have any particular time frames in mind in order to accomplish a specific goal of what we'll see in the future. For us, such an objective would diminish the sense of freedom we feel in our singular objective to "do it our way" not by some preconceived notion of "how" one "should" travel the world. Of course, we always have some locations booked well into the future. However at this place and time, with added experience, we've found we don't need to book two years in advance. We did so in the beginning, more out of a desire to feel "secure" in knowing where we'd be in the future. St. Mary Cathedral in New Plymouth, New Zealand on it's last day before being closed permanently due to it's lack of safety during earthquakes. See our link here. Now, all these years later, we're confident enough to "wing it" from time to time. At this point, we have no idea where we'll be living in Marloth Park in 4½ months and feel confident we won't be living in a tent in the bush. Wisdom and peace of mind come from experience. We still have so much to learn and will never reach a point in our world travels where we feel or assume we know how to do it all. It's a fluid experience that continues to grow and change along with the changes that occur wherever we may travel. The Wai'oli hui'ai Church in Hanalei Kauai Hawaii which the congregation built in 1841. See our link here. There's nothing static about world travel. The risks fluctuate. Our response to experiences change. Conditions in countries can change in a moment. Our personal interests can change "on a dime." However, one thing we know for sure, is our desire and passion to continue on this journey hasn't changed, our desire and passion in living this life together hasn't changed and, our desire and passion for sharing it all with YOU hasn't changed. St. Mere Eglaise Church with the Paratrooper Memorial in Normandy France which appears on the left of the church in this photo. See our link here. Tom and I both ordered the surf and turf platter at Puri Bagus in Lovina Bali.. He gave me his prawns, squid and veggies while I passed him my fries, flatbread and onion rings, requested on a separate plate. The steak was a tenderloin, cooked to perfection and the most tender we'd had in a long while. For more food photos, please click here. San Rafael Archangel Parish located in Atenas center of town, across from the park. A few workers stopped by to help Ulysses with a landscaping project. As we've traveled the world over these past years, it's inevitable that we continue to visit one church after another. Actually, its highly unlikely to tour cities, towns, and villages without stopping to revel in the architecture and ambiance of churches of many denominations. The Parochial school at the church. Several parishioners were praying when we entered the church in Atenas. Even those of a variety of faiths or no faith whatsoever can find themselves entranced by the beauty and significance of these historical buildings especially when involved in a specific tour when traveling in a group, on one's own or as part of a tour during a port of call while cruising. Long view of the altar at San Rafael in Atenas Costa Rica. We can't say that any particular church we've visited had more of an impact on us than others throughout the world. 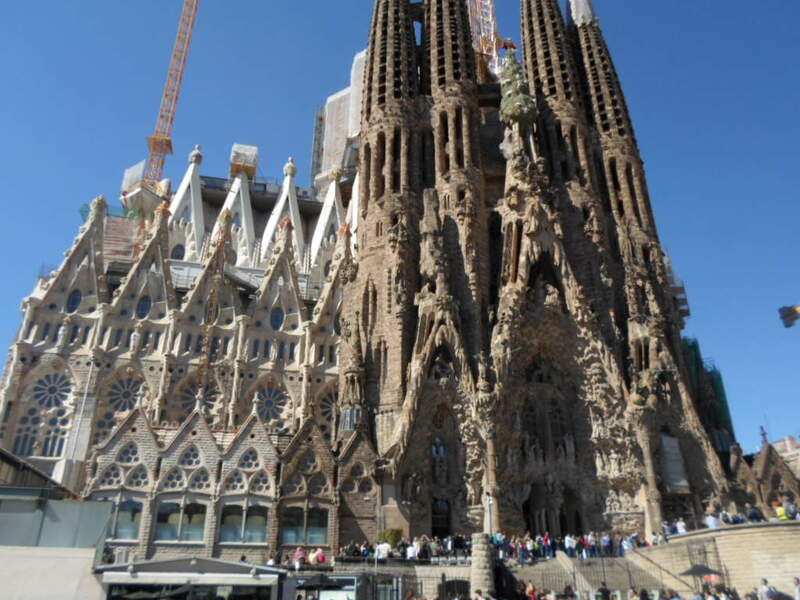 We loved Sagrada Familia in Barcelona in May 2013 and its amazing history of being under construction for the past 100 years. See photo below along with our link here. Sagrada Familia in Barcelona Spain has been under construction for the past 100+ years. Then again, we were equally excited to see the church in Bampton, England in August 2014 where the church scenes in Downton Abbey were filmed. Having loved the British TV series, it was quite a thrill to see the church where characters Mary and Matthew were married and eventually where he was buried in the church cemetery. See photo below along with our link here. This is St. Mary's church in Bampton, known as Church of St. Michael of All Angels, as shown in the TV series, Downton Abbey, where Mary married Matthew, Edith was jilted at the altar and eventually Matthew was buried. Another outstanding religious structure, The White Mosque in Dubai in May 2013, left us breathless over its beauty and opulence. Here's our link including photos of us wearing the required clothing to enter, the thobe for Tom and the abaya for me. As we approached Sheikh Zayed Mosque. It was difficult, based on its size and location to get a full shot of the mosque's enormity. The link above will clearly depict its full range. The opportunity to visit these churches and more, which we'll continue in tomorrow's post with links and photos, definitely has left us reeling over the powerful significance and purpose for the people of most countries. In other countries other than Costa Rica we've never seen these glass coffins with Jesus. We assume the representation in this manner is cultural. At times, while chatting with cruise passengers we may jokingly say, "If we never tour another church, we'll have seen enough to last a lifetime." But, we say this knowing full-well that day will never come. Beautiful wood ceilings in San Rafael in Atenas. As we continue on our travels, we find ourselves drawn to these structures, not only as a tourist "attraction" and their often architectural beauty but for the powerful purpose they possess in the lives of the local people which in many ways has shaped their lives and over time, ours as well. Close view of the altar. Please check back tomorrow for more churches we've explored in our travels, each with a special story of its own and as an integral part of our ongoing world travels. Crucifix on the grounds of San Rafael in Atenas. Have a beautiful day, dear readers/friends! Traditional Hindu/Balinese decorations were used in creating the ambiance for dining on the cabana at the resort in Bali. For more details, please click here. Basilica Nuestra Senora de las Piedades is one of the most beautiful Catholic temples in Costa Rica, unique in its Renaissance style, was built between 1924 and 1928. Colorful flowers are blooming throughout the villa's grounds. Ulysses takes great care to ensure everything is perfectly groomed. Naranjo is the capital city of the canton of Naranjo in the province of Alajuela in Costa Rica. It is also the name of the district that includes the city. The district of Naranjo covers an area of 25.75 km² and has a population of 19,760. Many towns in Costa Rica have Central Parks such as this in Naranjo. "The town of Naranjo, settled in 1830, was originally known as “Los Naranjos” (the Orange Groves) due to the abundance of orange trees in the surrounding area. Although the name has been shortened and the amount of orange trees lessened, this city of 35,000 has remained an important agricultural hub for Costa Rica. Set at the base of the Espírito Santo Hills in Costa Rica’s gorgeous Central Valley, the area surrounding the town is stippled with farms growing all kinds of crops– plantains, corn, tapioca, coffee, rice, beans, sugar cane, tobacco, and beef, to name a few. On a recent road trip, we visited the town of Naranjo to see this church, the Basilica de Naranjo. The coffee plantations are perhaps the best represented, and plantation tours are becoming increasingly popular among tourists. This fertile area is drained by the Grande Colorado, Molino, Barranca, and El Espino rivers, and, at an elevation of 3,398 feet (1,036 meters), the temperature is a consistently cool 68° F (20° C). Each year a large festival honoring of the Virgin de Lourdes brings in visitors from all over the country to Naranjo. Additionally, there is an attractive baroque-style church in town that is worth checking out. Many local citizens travel on foot to get to around town when cars are expensive and bus service is limited. Capital city of the canton Naranjo in the Alajuela province, Naranjo is 27 miles (44 km) from San José. The town of Sarchí, renowned for its abundance of fine handicrafts, is 3 miles (5 km) west. The road north leads to Ciudad Quesada and the Northern Lowlands, and is one of the country’s most picturesque drives. Other popular destinations, including Monteverde, Arenal, and Guanacaste, can be reached from here as well." The warmth and friendliness of the people of Costa Rica are evident wherever we may travel. They often smile when walking past us and many often say, "hola or Buenos Dias". There's no doubt in our minds that in many countries locals can determine that we're Americans. I'm not sure if there's an "American look" but we must have it since even before we speak, it's often presumed. Speaking of friendliness, after spending nine weeks in the USA this past summer and after seeing many of my girlfriends, I simply couldn't go back to our lives of world travel without staying more closely in touch. The clock is the correct time. In these past two months since we left the US, I've had the opportunity to speak with four of my long-time girlfriends on Skype. No words can express how enjoyable this has been. Yesterday, I spoke to my dear friend Colleen, who worked for me 35 years ago in real estate. We've stayed in close touch by email and Facebook these past years. In 2013, while on a cruise in the Caribbean I was able to visit her in person when she lived on the island of St. Thomas for many years. The municipal building is located across the street from the Central Park in Naranjo. We'd hope to see the interior of the church but it was closed due to renovations. Mass is held outdoors on the grounds of the basilica. However, we hadn't talked since we visited St. Thomas on April 17, 2013, when St. Thomas was a planned port of call during the cruise. Click here for our post from that date. She's since moved to Florida. We talked about the many hurricanes she experienced over the years in St. Thomas and the worry and concern she shared with other Floridians over the recent devastating hurricanes. Fortunately, her current home weathered the storm well and all is fine and good for her. This historic outdoor altar is where church services are held while the church is under construction. Tom walked with me to the center of town where Colleen and I planned to meet and went back to the ship on his own. Later in the day, he met me at a nearby fountain and walked back with me to the ship. It was wonderful to see her then and equally wonderful to chat on the phone yesterday. We promised to stay in touch by phone in the future providing we have a good enough Wi-Fi signal. Recently, with other friends I've done the same, spending time every so often chatting on Skype or now, Facebook's own free voice chat module. My sister Susan and I have been talking every week, Julie less often and other family members as their schedules allow. In today's world, we've found talking on the phone is less of a priority to younger generations when social media and texting play such a bigger role. Cattle near the road on a small farm. ﻿Today, we're staying in. We haven't been able to use the pool for many days due to heavy thunderstorms with lots of lightning throughout most of the day. Of course, it's still the rainy season (aka green season) which continues from May to November but we're making the best of it, never letting the rainy days get us down. We're content. We hope you are too! We lounged in this (one of many) cabanas overlooking the sea at Puri Bagus Lovina, in Bali with iced tea in hand and books to read on our phones as we continued the five-day process at the nearby immigration office to extend our visas. For more details, please click here. Power outage...Tom heard transformer blow..